What is the generation source least valued by Ontario's electricity market in 2017? That is the question I asked on twitter the other day. I know it's not the most serious format, it's a small sample size, and my running the poll means there will be selection bias in the responses. I did invite others with different views of the energy world to share it - but they did not. I got some feedback that the question was unclear. While there are multitudes of factors impacting/corrupting the metric, this question is precise. The IESO allegedly operates Ontario's electricity market, they do publish summaries for hourly generation by fuel (xml format) and they do publish an Hourly Ontario Energy Price (.csv format). The least valued "fuel" - or generation source - this year as the 22nd of June, is the lowest valued by a big margin, lying 29% below the next least valued. The lease valued source is the source least expected to be the least valued. The least valued source is solar. Which shouldn't come as a surprise. I'll briefly review the theory, put Ontario's experience in a broader context, and finally cherry pick one day to examine. Cynics may be surprised the day is June 12th, which is the highest demand day of 2017. The theory is very simple. Most solar in Ontario will produce about half of its annual generation in about 10% of all hours, and 80% of the annual total in 20% of those hours. 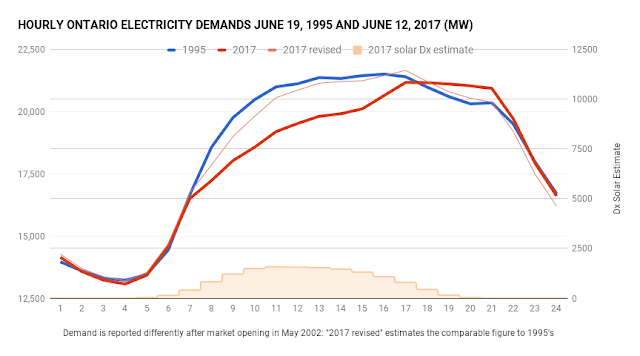 As solar capacity grows and past the difference in daylight peak and darkness peak demand, the value of solar output starts to deteriorate rapidly. 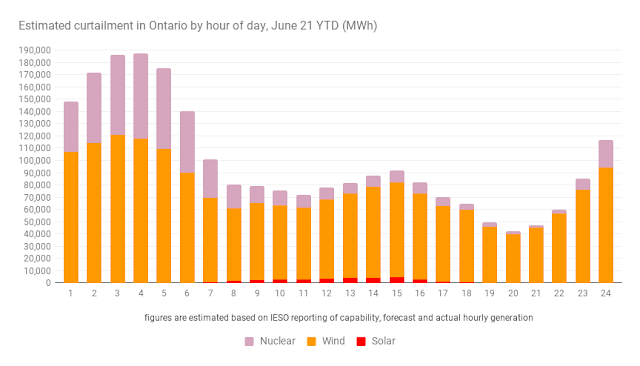 In Ontario the deterioration would be expected to come quickly as "baseload" generators (those the are designed to operate continuously) meet the base load (minimum demand), and then some. For a good explanation of what should, by the end of the paper, seem obvious, I recommend Lion Hirth's The Market Value of Variable Renewables:The Effect of Solar and Wind Power Variability on their Relative Price. By the end of the period, the amount of ...grid-connected solar is expected to remain at 380 MW. By the end of the Outlook period...embedded solar will surpass 2,200 MW. The IESO only reports on "grid-connected" (Tx) supply, so most solar is hidden beyond examination. Ranking in North America isn't simple as solar capacity is not well reported anywhere, but it is plausible that the province is number two, to California, for embedded (hidden) capacity. The LA Times published a lengthy report showing the same price issues I'm calling attention to in Ontario, California invested heavily in solar power. Now there's so much that other states are sometimes paid to take it. In the first two months of this year, CAISO paid to send excess power to other states seven times more often than same period in 2014. “Negative pricing” happened in an average of 18% of all sales, versus about 2.5% in the same period in 2014. Inter-zone power flows result from real-time mismatches between load and generation within each zone. All zones outside the Central Region are low-demand areas with relatively substantial wind-generation capacity. This mismatch leads to curtailed supply and increased exports from those zones. I'll return to the solar topic, but this new paper meshes nicely with a web page I've created to map estimated curtailment (and generation) in Ontario by the hour. It's primarily a curiousity as it's a snapshot of IESO data sets for the current day only, but looking at it in recent weeks it's apparent most curtailment is where Marc Brouillette would expect it to be. Th two sets of graphics now - the first from California's ISO is contained in the previously cited report, with the following my estimates of comparable data for Ontario. The indication is Ontario has curtailed 7-8 times more electricity than California thus far in 2017. 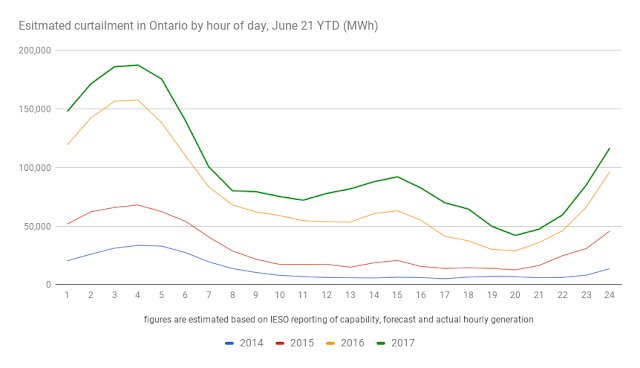 As you can see solar is not the biggest curtailment concern in Ontario, but it is not nothing and, more importantly, overall curtailment now has a secondary peak at hour 15 (which is 3-4 pm in the summer, and 2-3 pm during Eastern Standard Time in the winter). 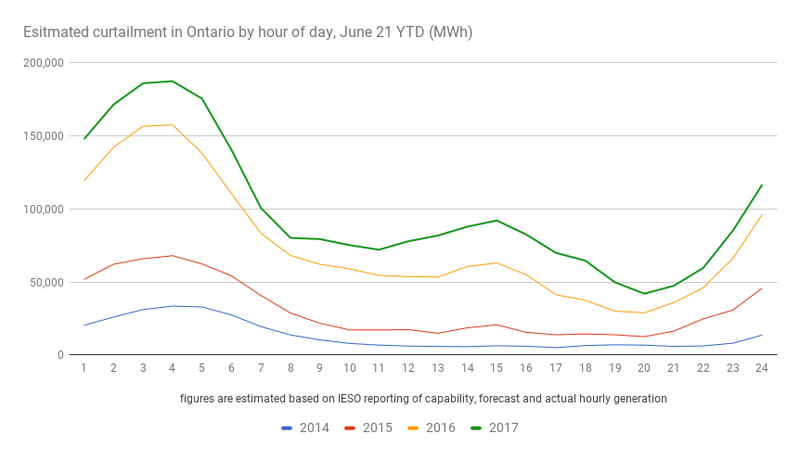 One more view of Ontario data, this time with my YTD estimates from the previous years shows that curtailment has grown in all hours, but notably that hour 15 secondary peak developed since 2014. I'll try to put all this together using the highest demand day of 2017 in Ontario: June 12. The basic data for hourly generation and Hourly Ontario Energy Price (HOEP), with the hourly valuation shown - all generation and all valuations totaled and the average value of each source calculated at the bottom. As demonstrated by my poll results, I'm sure there's some cognitive dissonance around this simple display - but there's no trick being played. Beyond these numbers are other factors, and interpreting those leads to other, far more speculative numbers. The databases I've built consider curtailment, and embedded/distribution-connected (Tx) generation in my reporting. These are necessarily estimates, but I feel reality is better reflected in estimating them. It is a lot more complicated. The next graph show reported "Demand" for June 12, 2017 and a similar demand Monday in June 22 years earlier. Today "Ontario Demand" refers to demand for production from generators to meet Ontario load, and that means embedded (Dx) generators are essentially negative demand. More confusing for comparing to the 1995 data is the early data is reportedly metering data - which presumably does not include transmission or distribution line loss both of which are included in "Ontario Demand". So... I've shown in bold the reported data, and I've added a line estimating June 12th's demand in 2017 inclusive of embedded wind and solar but adjusted for line losses, and I've displayed an estimate of embedded solar generation on the right axis. This explains why the market values solar cheaper - embedded solar is lowering demand during hours of plentiful sunlight, pushing higher loads, from the perspective of market participants, into the evening hours. It's easy to answer what the market valued the supply it procured at, only slightly more speculative to value unreported distributed generation at that market price, and more speculative again to value estimated curtailed supply, which is removed from the market altogether. But just adding up the 3 figures (Tx, Dx and curtailed) as the hourly generation and repeating the simple process above does change, to Wind, the low-value generation source for this one day. I don't value generation exactly this way in my data work, but that work also shows solar the least valued source this year. Solar is the least value producer in the first half of most years, and if summer is particularly hot, or natural gas prices swing rapidly upwards for another reason, wind - which is needlessly productive in the fall - could be of lesser value by year's end, but that is increasingly unlikely. In his respected and popular "10 predictions for" the coming year article for 2017 Michael Liebreich pushed the phrase "base-cost" renewables. The cost promise is a necessity. Lion Hirth's work, which I noted earlier, presents a challenge in that variable intermittent energy systems, specifically wind and solar, need to see costs decline more rapidly than value to achieve a market share that would be significant in decarbonizing energy systems to the extent governments, and non-governments, have indicated desirable. It really doesn't matter, in my view, what the price of a product with no value is. Indications are growing that wind and solar get to no value very quickly in low emissions systems. If low emission systems are desirable, I think people should start paying attention to low-emission systems, which are dominated by hydroelectric and nuclear power.